Osama bin Laden is dead. US forces claimed they killed the world’s most wanted man at a mansion outside Islamabad. So, it was Pakistan where this big fish had been hiding. Any doubt…. who’s safe in Pakistan? 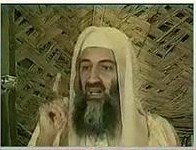 Well, bin Laden’s death would benefit US President Barack Obama the most, as America prepares for the presidential polls. He had authorised CIA to make the capture or killing of the “mass murderer” the topmost priority. And just when Obama was being criticized for being just an ordinary American boy, he sprung the surprise. This catch of the al Qaeda chief is really a huge one. But, will peace now return to Iraq, Afghanistan and Pakistan, Mr. Obama? Is terror dead, Sir? Will US withdraw its forces from these mountainous regions, Mr. President? I remember the day when Iraq’s Saddam Hussein was hanged. The hanging was shown all over the world. And there was silence. Osama bin Laden’s death too would be received in peace. And there would be peace when we see his body too, which is in US possession. God Bless America. Let peace prevail all over the world. How do you say so? US is saying that they have burried him in sea. Do let us know of your others secrets too. It is wishful thinking that with Osama terror has ended. No that is not the case. Terror in this world will end the day all humanity will speak out in one voice against countries which are actively providing support & sustenance to these blood thirsty murderers. Lesson for us is not all issues can be resolved thru dialogue; efficacy of means depends on the results desired & achieved.